There have been a lot of new games lately that have the Zelda ring to them. Whether it’s upcoming games like Tunic and Oceanhorn 2: Knights of the Lost Realms, or already released games like Blossom Tales, it can all seem pretty overwhelming. 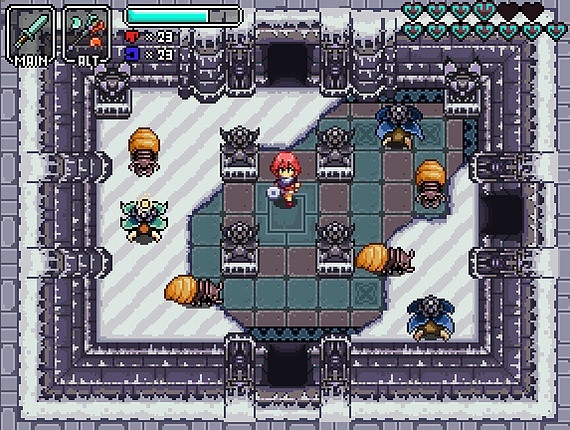 And now there is another upcoming Zelda-esque title on Kickstarter right now: a 16-bit adventure game called Hazelnut Bastille. Developed by Aloft Studio, this game has A Link to the Past written all over it. Also worth noting, Aloft Studio are working with the legendary composer Hiroki Kikuta, who you may know best for his work on Secret of Mana. Aloft Studio’s initial goal for releasing the game for PC, Linux and Mac is 65,000$ and at the time of writing, they have raised more than half this amount. There are further goals to this project, such as more levels, localization to different languages and even a version for the Nintendo Switch. Other rewards for pledging certain amounts include a copy of the game’s soundtrack, access to alpha and beta tests and even designing collectibles or enemies. But there’s more to it than just backing them up: A demo of the game is free to download right now. It contains a few hours of gameplay, plus a whole dungeon not present in the final version, so it’s all the more worth it.